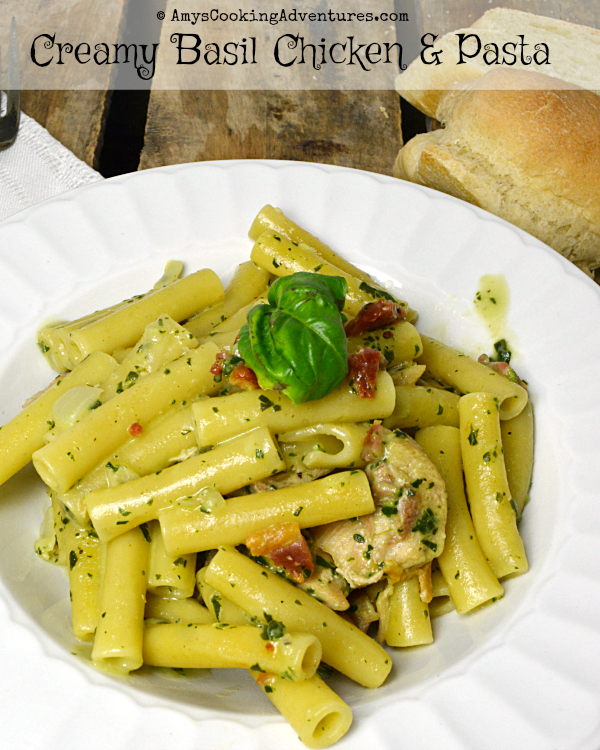 Creamy Basil Chicken & Pasta is a weeknight staple! 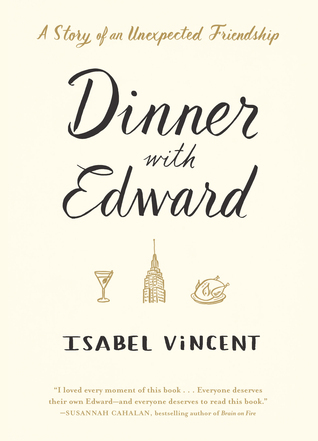 Today’s recipe in inspired by this month’s Cook the Books Club pick, Dinner with Edward by Isabel Vincent, hosted by Claudia at Honey from Rock. 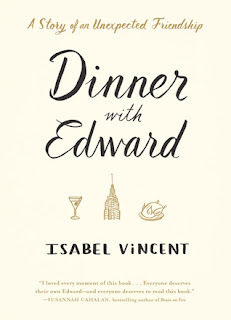 Dinner with Edward is a memoir, focusing on the author, at a crossroads in her marriage, meeting and beginning a deep friendship with her friend’s elderly, recently widowed, father (Edward). It was so easy to love Edward. Through the book, I felt like I was really able to get to know Edward. Edward was worldly, yet old fashioned, and utterly charming. The author however? I couldn’t have cared less about her and problems, which seemed greatly self-imposed. There was plenty of food inspiration throughout the novel, though I was wishing throughout that there would be some recipes included (especially since each chapter began with the mouthwatering menu of the day). Since there weren’t recipes included, I decided to go for what stuck in my mind. There were some amazing sounding desserts and plenty of steaks. Plus pesto was mentioned several times. Even though this recipe doesn’t include a true pesto, it does have a crap ton of basil, so I figure it’s close enough. This meal came about on one of those super busy weeknights. I had planned to make Tater Tot Casserole, got home late and didn’t have time to get it together. So I started tossing together some crowd pleasers I already had on hand! It was a definite crowd pleaser, and even though Edward was a bit more planned out and meticulous in his cooking, I have a feeling he’d approve! Heat a skillet over medium heat. Add the bacon and cook crisp. Remove the bacon, & crumble, set aside. Drain off excess drippings. Add the chicken and onions. Cook until the onions are soft and chicken is mostly cooked through. Add the garlic and cook until fragrant. Season with salt & pepper. Stir in the broth and pasta. Bring to a boil, then reduce heat and cover. Cook for about 9 minutes or until the pasta is tender. 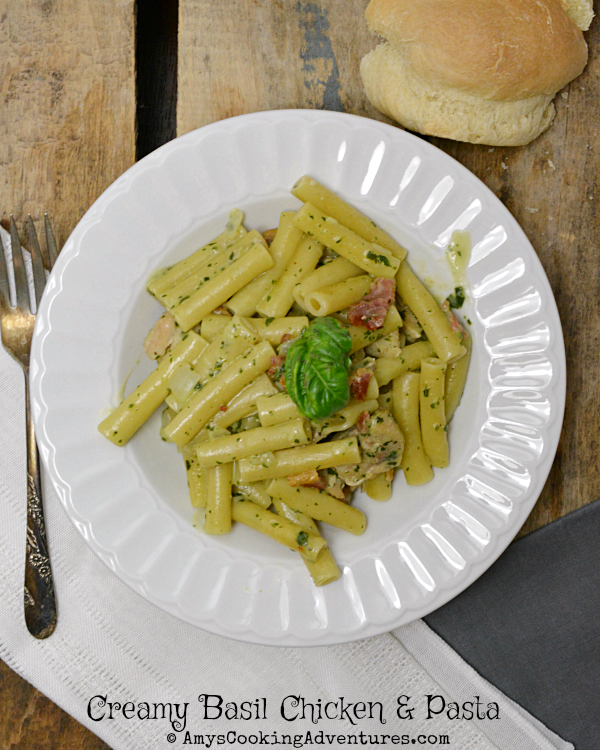 Stir in the cream cheese, basil, parmesan, and bacon. Heat through and serve. You are always so ON it with these club deadlines. I'm about halfway through the book, patting myself on the back for being ahead of schedule. And this looks fabulous, Amy! Thanks for sharing. It does sound yummy Amy, and yes, I'm sure Edward would approve. Especially if he had just come home late from work. Glad you enjoyed the book, aside from the author's angst and issues. But, then her association with Edward was therapy. I always get so frustrated with memoirs about people whose problems are all of their own making. I guess it is easier to see that in others than in ourselves though. "Crap ton of basil"! LOL Great recipe and good inspiration from the book. My post will be up tomorrow.